Earlier today I posted a photo on Jules Organic Living Facebook of my papaya tree. She has a few new babies on her and I am thrilled!! I love, love, love, papaya. It is an amazing fruit. I find that it really helps my digestive system. I have a really happy belly after I eat it. Do you like papaya? When I mention this fruit to people, I get a lot of “ewww” faces. In other words, it isn’t their favorite. I was playing around in the kitchen one day and I created a scrumptious salsa recipe. I am sharing this with you today so you too may consider giving this beautiful fruit another chance. So ready or not, here we go! Would love to dip an organic sweet potato tortilla chip into that parfait glass full of salsa !! Yum !! Yum! 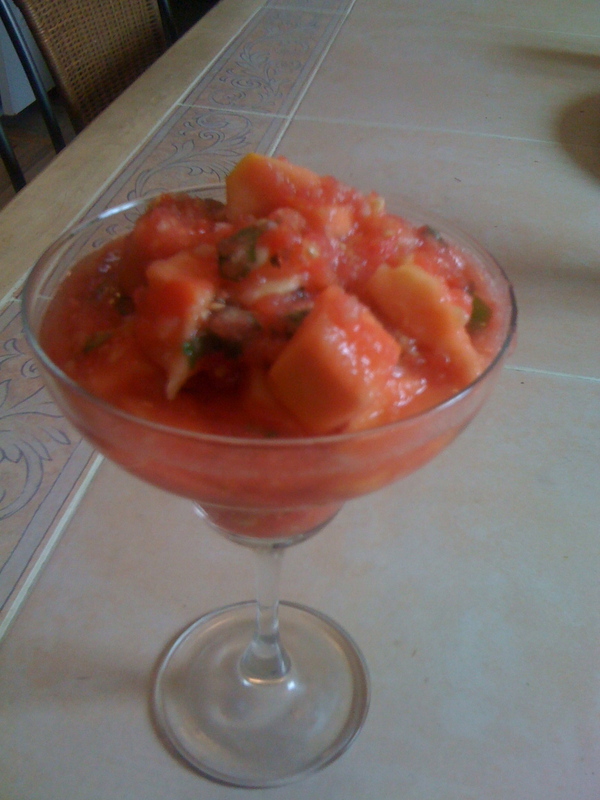 Nothing like good fruity organic salsa…Check out this recipe!